I love the Yarn Along hosted by Ginny over at Small Things. I love her photos, I love getting ideas for knitting and most of all, I love having new book titles to add to my Goodreads want-to-read list. I haven't been here for a while but I'd like to come back more regularly. Browsing the Yarn Along is definitely a favourite thing for me and a sign that life is in balance if I can make time for it. In terms of books, as always, I have several on the go at once. Right now, I am focused on three books. 1. Between the World and Me by Ta-Nehisis Coates. This is the book choice for this month at the Red Couch Book Club over at She Loves. This is one of my favourite faith pages and one of my favourite book clubs. For a progressive Christian like me, it can be very hard to find sources of good reading and so far, I have loved all but one of the Red Couch books. I won't lie, this one is challenging for me. This is written in the form of a letter from a father to his son and is basically a treatise on being black in the U.S. I think, as a white woman in Canada, it's far outside my world and can be very challenging but it's interesting to see the world from such a different perspective. 2. Suite Francaise by Irene Nemirovsky. At my school, someone started a bring and take table of books in the staff room and this is a book that I saw that piqued my curiosity. It's the story of a variety of people France during the occupation during WW2. I believe that it was written by an author who was Jewish and was in hiding and wrote but later in the war, she was sent to a camp and eventually died. The manuscript was found later and has fairly recently been published. It's an interesting read and I find the characters oddly gripping but it's not exactly a light read and it's going very slowly. 3. Certain Women by Madeleine L'Engle. L'Engle is probably my favourite author of all time and I've read most of her books (although I am not sure I have read all of them and I know that I have avoided the Wrinkle in Time series). I've been gradually buying her books secondhand (I LOVE getting books in the mail and there's something wonderful about secondhand books that have a past) and this was my most recent purchase. It was interesting for me because I just finished reading The Rock that is Higher, which is a set of essays and which she wrote around the same time as this book and she often refers to this book. As always, I love her and I love her style! 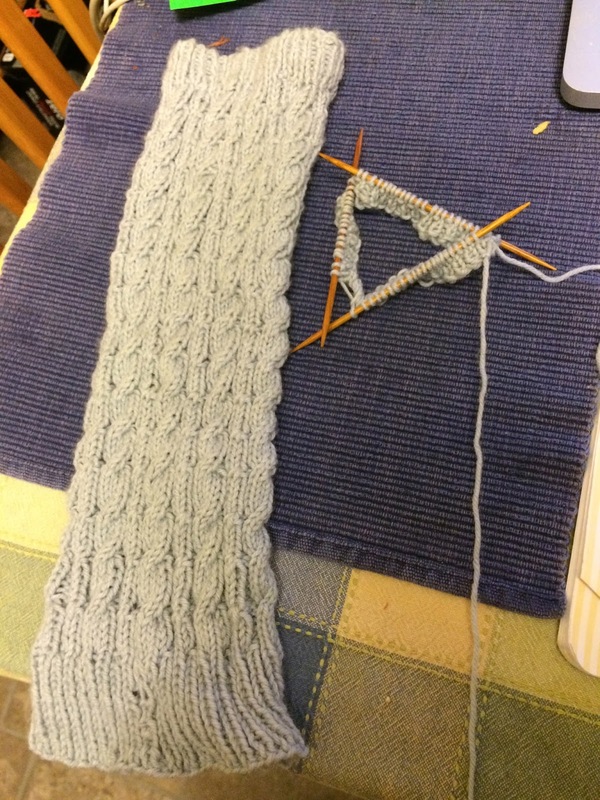 My knitting has been moving slowly of late but next week, during our March Break, I am hoping to make some progress. Right now, I'm working on this lovely pair of leg warmers for Pk to wear when she is skating. I can't wait to see what everyone else is doing! I read Between the World and Me and found it fantastic. But then I live in the US. Coates studied under Toni Morrison, a remarkable author, though at the end of many of her paragraphs I'll think "I have not idea what that meant but my heart is racing regardless." Another book, covering a similar subject to Coates' is Brian Stephenson's Just Mercy. While Coates is not a Christian (not that it's a weakness to his power & persuasiveness), Stephenson is and he uses his Christian worldview with strength. I am loving it but it's also hard to read. It's a world that is so foreign and I don't think that I really grasped the impact that fear plays on EVERYTHING. I LOVED Just Mercy (which was another Red Couch read a few months ago). The race situation is so complex and it's so hard to see how to repair the inherited pain of hundreds of years of cruelty. As a Canadian, we get to pretend that it really isn't our story but given the situation here with how our indigenous peoples were/are treated, we are wrestling with a very similar struggle. Thank you for visiting and thank you for commenting! beautiful knitting!! My reading is always slow and yet I wonder why I do not make more of an effort to carve out more time for something I love to do?? Thank you for stopping by, Karen! I feel the same way about my knitting! It gives me such peace and satisfaction but I never seem to spend as much time knitting as I would like!